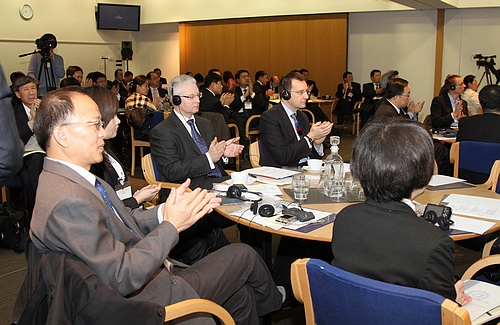 Let me offer my warm congratulations to you on the opening of the Third China-UK Internet Roundtable. I wish to take this opportunity to warmly welcome Minister Wang Chen and his delegation to London, and to thank Minster Ed Vaizey for his presence. My thanks also go to BIS for all the thoughtful arrangements they have made for the roundtable. The Internet is one of Man’s greatest inventions in the 20th century, which has fundamentally changed the way people live, learn, work and communicate. In his book Weaving the Web, Tim Berners-Lee, the British inventor of the Internet, talked about the future of the Internet, saying that “the ultimate goal of the Web is to support and improve our web like existence in the world”, and in the context of this roundtable, I believe this means that if we use it wisely, it will prove to be a “win-win” for us all. The Internet has also become a new factor in international relations, as a simple means of communication that defies national borders. And today we are seeing it actively playing its part in moving China-UK relations forward. -- The Internet is facilitating China-UK cooperation in all areas. As it allows businesses from our two countries to access market information and provides convenient ways to communicate. This has made it into a powerful E-commerce platform, which has led to higher efficiency, lower costs and closer cooperation, particularly among small and medium-sized enterprises (SMEs). The Internet has also made sharing of scientific research easier and brought about more academic exchanges and joint research. One result of this China-UK joint research has been the 4G mobile communications network, which will be used during the 2012 London Olympics. -- The Internet is bringing China and the UK closer. As an ancient Chinese poem reads, “Best friends are like close neighbours, even when thousands of miles apart.” This may have been a dream in ancient times, but the Internet age has made it possible. Distance has disappeared and people now have a more convenient way to access wide range of information in political, economic, cultural, educational and tourism fields. And thanks to the Internet, from here and across the world, we were able to watch online the Shanghai World Expo which was successfully concluded just a few weeks ago. 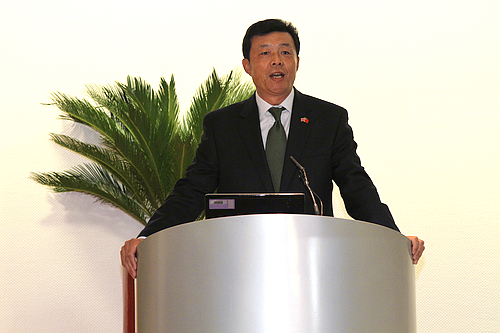 -- The Internet is opening up new prospects for China-UK cooperation. China’s rapid internet growth has now made it the largest market with over 400 million users. The UK, in comparison, has a smaller user base, but it boasts advanced Internet technologies and is developing the fastest broadband network in Europe. Two-thirds of British businesses have started to use Cloud Computing and the UK is leading the world in E-commerce, as it benefits from its well-developed legislation and regulatory systems. Given the unique features of our respective Internet sectors, the Internet is becoming another major area where China and the UK can cooperate. I am pleased to see exchanges and cooperation between our two countries in Internet technology, application, policies, legislation and web security. The annual Internet roundtable, in particular, has become an effective channel for our two governments, the media and businesses to share experiences, analyse opportunities and challenges and discuss how to strengthen cooperation and mutual understanding. Two weeks ago, I had the privilege of accompanying Prime Minister David Cameron on his successful visit to China. During the visit, leaders of our two countries reached extensive consensus and charted the course for China-UK relations. They expressed a shared commitment to strengthening strategic mutual trust, expanding common interests and deepening mutually beneficial cooperation. I hope that our governments, media and business communities will make a joint effort to put our leaders’ consensus into practice, by stepping up exchanges and cooperation in the Internet industry so that it serves as a bridge between the two countries and as an engine for stronger China-UK relations and greater mutual understanding. 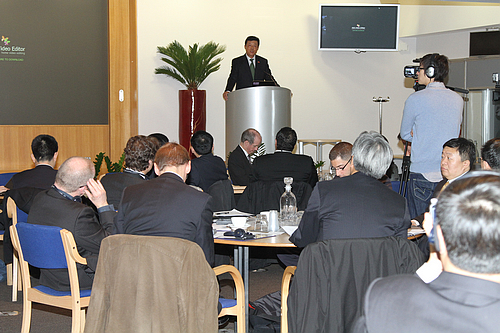 In the end, I wish the Third China-UK Internet Roundtable a great success.